"Conor has the same dream every night, ever since his mother first fell ill, ever since she started the treatments that don't quite seem to be working. But tonight is different. Tonight, when he wakes, there's a visitor at his window. It's ancient, elemental, a force of nature. And it wants the most dangerous thing of all from Conor. It wants the truth"
I can't get over how amazing this book was! I have heard a few people say how good they thought it was, but this book, now that I have read it, means so much to me. This definitely going to be a story that stays with me forever! 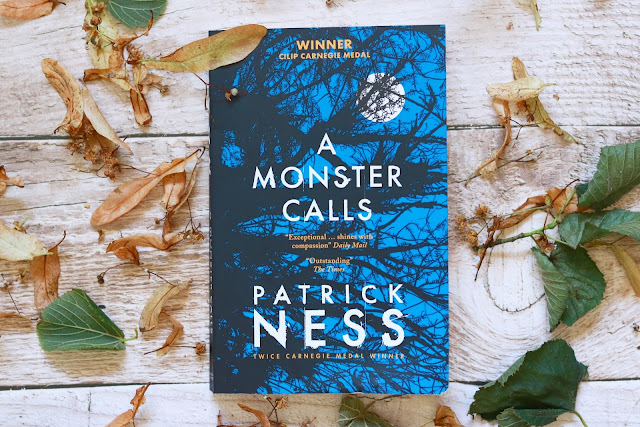 'A Monster Calls' is a sweet yet bitter story of a young boy called Conor who is dealing with his mothers illness. It truly is a wondrous tales of courage, bravery and facing your fears. I learnt a lot about myself and my way of thinking when reading this book; some of which I was quite surprised at knowing. I felt the same fear, frustration and confusion as Conor, and Ness really makes you feel the same feelings as Conor; absolutely other-worldly writing! I have so much to say about this book, but I simply cannot put it into words; this is something that must be read, something you feel and experience for yourself. I cried so much whilst reading this book, mainly because I somehow felt like I knew what it was like to go through those emotions, even though I haven't. I cried because I felt like I know what the characters were going through, even though I didn't. I think that's what makes this tale an amazing one. Ness makes you feel like you are going on this journey with Conor, and in turn, you learn things about yourself that you didn't once before, just like Conor. I only wish that this story would have gone on for forever, but then again maybe not; for we all have to let go of things. After all, that's how we grow. my little sister is reading this at school. thanks for the review.